Just wanted to give you all a heads up that The Risky Kids will be taking a mini hiatus for the next 3 weeks. Not coincidentally, that’s about how long we have until school starts again. 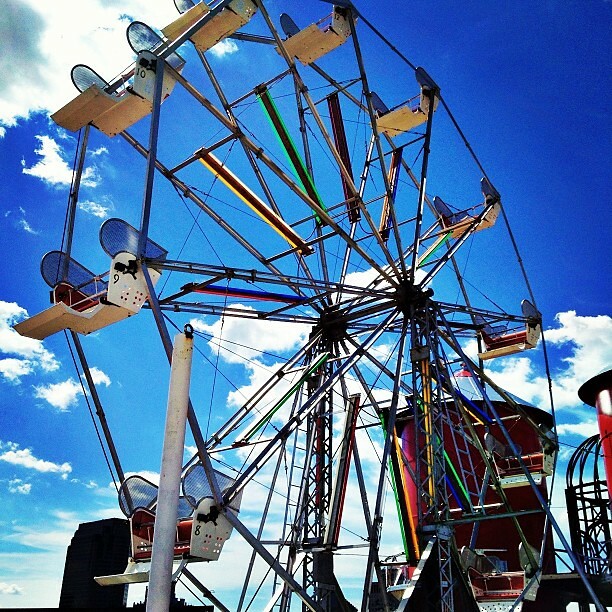 The summer is flying by too quickly, and the kids and I collectively agree that we need more Ferris wheels, pool days, pajama fests and general sloth-iness in our lives before we return to alarm clocks, school buses and homework. This is also the last stretch of time I have to spend with Eli before he enters the world of kindergarten. I have a feeling you’d rather spend your last few days of summer vacation enjoying it rather than reading about it on someone else’s blog. So shut the computer down and go do something totally lazy and indulgent. 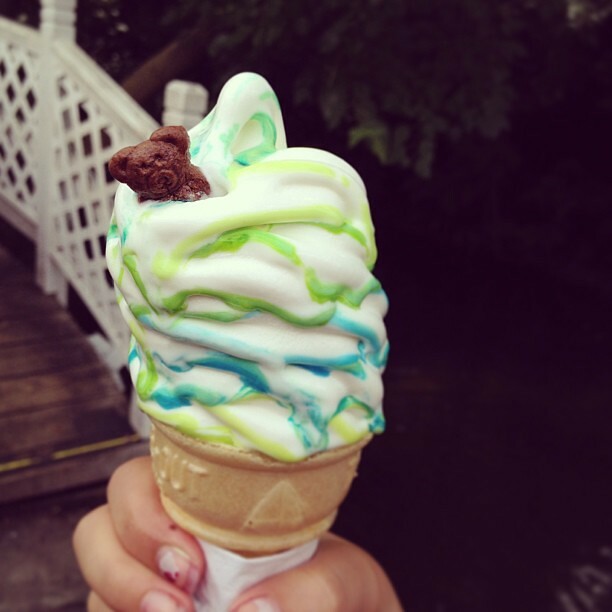 I don’t care how old you are, summer only comes once a year and it’s meant to be savored. Lisa has a few posts in the works that may (or may not) get published in the meantime. When we return in mid-August we’ll have loads of cool content to get you back in Risky mode just in time for fall’s cooler temperatures. Thanks for understanding. I can’t write authentically about living the playful life if I don’t take the time to play myself. Enjoy the rest of your summer and we’ll see you soon! If you find a few minutes to sit down and read in between ice cream cones and dips in the pool, here are a few things I found around the web that I thought you might enjoy. We recently redid the tween’s room to reflect her changing interests … you know, different paint, a few posters on the wall, purging books and toys. Apparently we missed the memo on the new trend: designer teen spaces. Do you think this encourages kids to stay close, or does it send the wrong message? The kids asked me how to play Ghosts in the Graveyard a few weeks ago and I was a little embarrassed that I actually had no idea! I love this helpful roundup of classic childhood games and their rules from Project Play. Have a water gun that’s lost it’s appeal? Kids hankering for a new, pricey one? Or do you have a kid that just loves to tinker? Show them this great resource to modify and upgrade common water guns over at Super Soaker Central. So many things to love about this DIY Water Blob from The Maker Mom: it’s easy, it’s quick, and it involves throwing things from high places. For more risky inspiration, follow us on Pinterest and like us on Facebook. And if you ever see anything you think we’d like, please share it with us! Nothing makes me happier than looking out my front windows and seeing our yard and the cul-de-sac in front of our home full of kids. We are lucky to have 11 kids just on our little street, and several more just a house or two away from our block that sometimes wander over to play as well. For the most part, it makes a parent’s life much easier. Once you get them started and provide a few raw materials, the kids take over and can play for hours at a time. We’ve spent many summer evenings coaxing kids in way past their bedtime, simply because it’s nearly impossible to drag them away from the outside fun. This is exactly why we moved here, and why I’m on a mission to continually transform our neighborhood into a Playborhood. However there are tradeoffs to having multitudes of kids playing in and on your property. I don’t bring up the subject to deter anybody from encouraging group outdoor play. That is absolutely my last intention! There can be somewhat of a bucolic view of outdoor play, though. Everyone’s happy, the kids all get along, we sing kum-ba-ya every night before we close our doors. That is not realistic, though. I would hate for anyone to get discouraged and think that encouraging outdoor play amongst neighbors – especially in their own yards – is not for them. Your yard will get messy. In Mike Lanza’s book, Playborhood: Turn Your Neighborhood Into a Place for Play (which I cannot recommend enough! ), he talks about knowing which neighborhoods have good potential for play by looking for “kid debris.” These are things like bikes on the sidewalk, toys scattered about, strollers parked on porches, etc. Well, if kid debris is a good indicator, then we’re off the charts. At the end of the day I often feel as if our neighbors without young children must feel as if the Clampetts have moved in. My attitude on this changes depending on my mood and the heat index. Some days I’m simply grateful that my kids are blessed enough to have a place and friends with which to make this merry mess. Other days I’m grumpy about it. But that’s pretty much how I feel about any kind of tidying up in general, whether it be in the house or in the front yard. 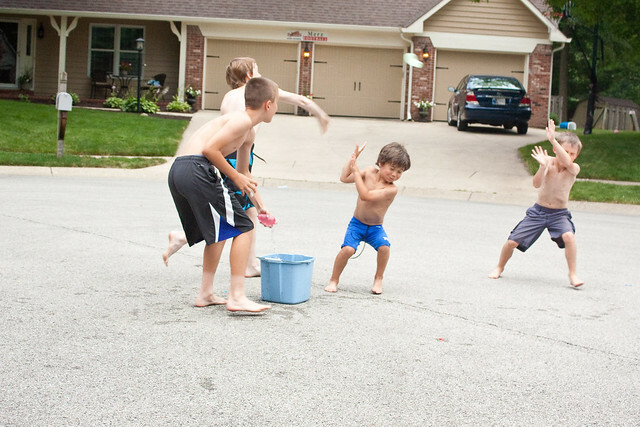 If it’s unusually messy, such as the time period when our front walk was water balloon central for several days in a row, I have no problem bribing asking all the kids to help. I buy cheap popsicles from Aldi and stash them in my outside freezer for just this purpose. Everyone who helps gets a popsicle when they’re done! Works every time. If you have a garage full of toys that aren’t dented, dinged, missing pieces or flat-out broken, you’re probably not doing it right. Kids play hard and things will get broken. Try to remember the big wheel of toy karma. Chances are good your kid has destroyed something that belongs to someone else at some point in their life. In the meantime, simply roll with it and try not to buy anything really nice. Your water and electric bill will go up. This doesn’t bother me as much as it does my husband. We don’t have a screen door on our front door, so it’s constantly being opened and shut as kids come and go and ask their myriad of questions. Nothing turns us into our parents as fast as a door being left open. In or out! Were you born in a barn? Shut the door! And if you let the kids play with water at all, you may feel your anxiety rising as you realize the hose has been running for an hour. Try to remember it’s a short season for playing with the hose (at least it is in Indiana). We have a 30 minute rule at our house. I will not bark about the water for 30 minutes. After that, it’s time to give it a break and move on to another activity … or someone else’s hose! I’m good at letting this one go, but I know that many other parents struggle with the bickering that can occur amongst groups of kids. If you can leave them outside unsupervised during these squabbles, even for a few minutes, find any excuse to remove yourself and step away. These conflicts are exactly what kids need to work through themselves. We learned our best conflict resolution skills as kids on the playground. We do them no favors by trying to solve the squabbles for them. In the end, they learn nothing and we end up annoyed. We have a wide age range of kids that play together (from teenagers to preschoolers), and I’ve found this to be extremely helpful in conflict resolution. It’s really cool to see the older kids model it for the younger ones, as well as to see them help the younger ones work things out for themselves. There will be blood, sweat and tears. At some point, if the kids are playing outdoors frequently, there will be some kind of accident. Most of the time it’s nothing more than a skinned knee or an injured ego. Be prepared, however, that it could be something requiring medical attention. Please don’t let that scare you from letting kids play in your yard. If it makes you nervous, go ahead and have a “what if” conversation with your neighbors. If you get the sense that any of the other parents are the kind that will freak the freak out if their kid comes home with a broken arm, then (sadly) you may want to limit play with that kid. Or at least save the slackline for a day when he’s not home. Sometimes you have to be the camp counselor. The worst conflicts will need a mediator at times. Other times you’ll need to pass out snacks or drinks. Games will stall or boredom will set in and you’ll have to encourage them to move onto something else. Don’t fret, though. As time goes on and the kids spend more time outside and with each other, they’ll become more and more self-reliant. I try to remember in all of these situations to step back and let the little things slide. My end goal is to encourage independent outdoor play. If I’m constantly policing and putting countless stipulations on what the kids can and can’t do, then they’ll soon give up and move on to things that don’t require so much of them … things like television, computers and video games. Let’s do our kids a favor and put up with a few minor inconveniences so they can get some major time outside. Later today I will pick up Elena from Girl Scout Camp. This is her second, and final, week at camp this summer. For 11 days and 10 nights we had absolutely no contact with her. We could send bunk notes (essentially email), but she couldn’t email back. I sent her with enough stationary and stamps for a trip to Europe, but she’s been too busy having fun to send home more than one postcard. My husband and I didn’t grow up going to sleepaway camps. I tried sleep away camp lite once and hated it. It was a day camp that culminated in sleeping outside on the last evening. I was 5 miles and only away from home for 24 hours, but don’t think I didn’t try every trick in the book to get my mom to pick me up before the day was over. Elena, on the other hand, really enjoys camp. Every year we offer her the chance to buddy up and choose a week with friends. She brushes us off and instead chooses her weeks based on the theme. This year it was Harry Potter one week and the Hunger Games (Kamp Katniss) the next. Every time she went without knowing a soul. Why do we think it’s important for her to go away to camp, when neither of us have good memories to draw upon? For so many reasons that I think are essential to growing up. It’s often a child’s first experience of pulling away. I want her to learn how to be away from us, and to have fun while doing it. I want her to start building that treasure chest of memories that don’t include us. I want her to have that sense of pride of doing something on your own. I want her to be able to survive for stretches of days without apps and texting and TV and be okay without it. She comes homes with the smelliest laundry and the best stories. The 90-minute ride home is full of chatter about all the amazing things they did during the week. Any parent of a tween or teen would tell you they would gladly pay whatever the camp fee is just to get a kid that wants to talk to you uninterrupted for 90 minutes. I hope the summer camp turns into a camp counselor. I hope the camp counselor turns into an eager college student. I hope the eager college student turns into a world traveler. And I hope she is never too homesick and she sends more postcards. 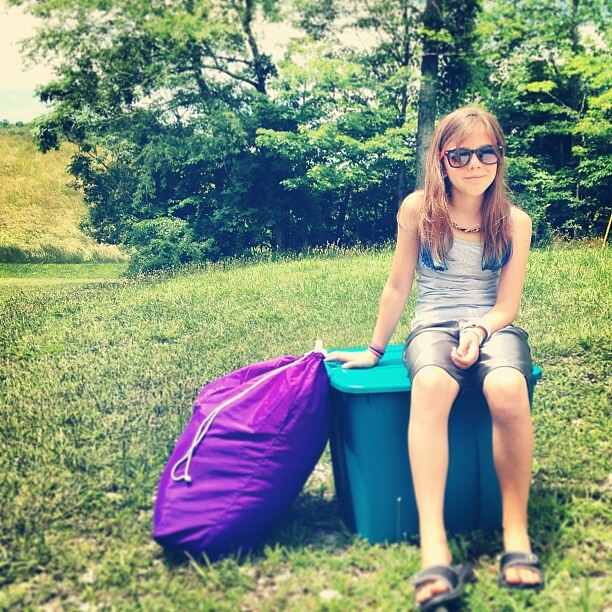 Do you send your kids to sleepaway camp? How did you know they were old enough to go? If you went as a kid, what were your favorite memories? I just had to go and tempt fate. Last week I wrote about why I let my kids try risky things, about how if they do get it hurt, it’s always doing normal kid stuff … like walking. Total rookie move … because guess where we ended up days later? In the Emergency Room. Eli was playing with another kid and walked behind him as he was swinging a rather hefty stick. It caught him right in the mouth. He needed a couple of stitches on his lip and a few more on the inside of his mouth. The kid is such a trooper. He cried when it happened, of course. It was scary – I’m sure it hurt like hell and there was a lot of blood. But once we got him calmed down and made our way to the hospital, he never cried once. He barely flinched when they gave him the numbing shots. Not a peep when the doctor stitched him up, other than saying “Ow” a couple of times. I want to cry just thinking about it. I’m not trying to be melodramatic, as I know that far more terrible things happen to children. 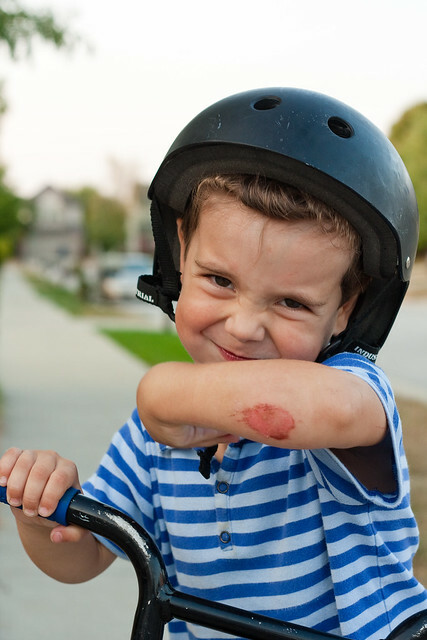 Stitches and broken arms are a rite of passage for many, many kids. But it is the most serious injury either of my kids have ever experienced. And as the writer of a blog that is centered around letting kids play freely, while knowing and accepting the inherent risks such play presents, I feel like I can’t write authenticly if I don’t let you know that the experience definitely rattled me. I got a clear glimpse as to why a parent would choose to say “no” instead of “yes.” I have every urge to watch Eli like a hawk from now on. I want to cover him in bubble wrap. I want to protect him from ever having to experience any kind of pain again. His wound is on the outside and visible. My wound – that I didn’t do my job as a parent and keep him safe – is open and festering just below the surface. I know it sounds a little ridiculous, but for the first time I understand the emotions and fear that can very easily turn a parent into one that chooses to helicopter over their children. The truth is, it could’ve happened any time. Why do we love our neighborhood so much? Because of the trees and the kids. Trees make sticks and kids are going to play with them (though we didn’t let the opportunity pass to talk about playing with sticks safely). It could’ve happened on one of their many bike races they hold in the cul-de-sac. It could’ve happened during one of their many impromptu games of street hockey or kickball. Childhood is chock full of near misses and terrible things that could have happened. And sometimes accidents do happen. But in between those near and not-so-near misses is the kind of fun that childhood memories are made of. While I will continue to be passionate about play, I also recognize that we will need a period of healing, both physically and mentally. I am going to hover a bit, until both of us feel better. I’m realizing that it’s okay, and that perhaps instead of immediately judging those parents who are a little more hesitant than the rest of us, we could find out why. What’s happened to their kids in the past, or to them as children? What are they afraid of? I’m reminded of the weeks after I had my knee surgery. I’d never been injured, never had surgery, and I was scared. Scared to put weight on it for the first time. Scared to go down the stairs. Scared to go back to work. Scared to exercise. Finally my physical therapist told me that I could choose to spend the rest of my life treating it gingerly and it would probably never be the same again. Or I could choose to work it – strengthen the muscles, do the rehab, build it back up to where it was before – and it would be just as good or even better than it was before surgery. It was a leap of faith, but I chose the latter. A year and a half later I don’t even think about my knee most days. I exercise, I move heavy pallets at work, I run around with my kids and I’m never anxious about it. But it took a lot of time and many, many baby steps to get there. It will be like that with Eli, I think. We are both shell-shocked and a little scared. 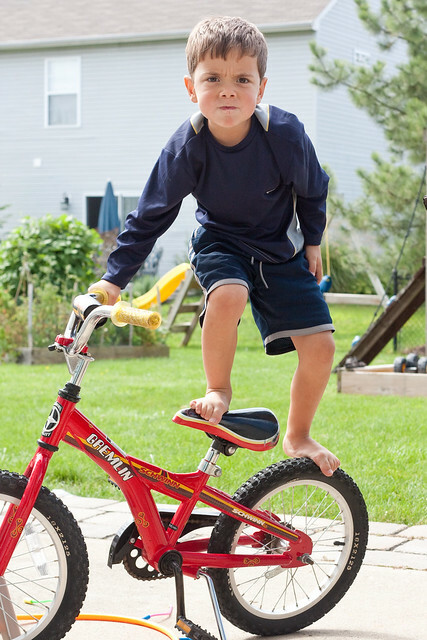 It will take time to move past the fear of accidents that are lurking around every childhood corner. I can spend the rest of my days as a parent being afraid of what’s around the corner, or I can choose to walk past those fears and enjoy the good things around the corner. You know us well by know, and know that we’ll choose the latter. We’ll just need some time to build up our speed again. Before the door even opened, I could sense it was bad. I heard the wails, intensifying with every step. I found Eli, sobbing, with blood dripping from his chin. It was a nasty cut, one that had Mike and I wondering if he might need stitches. He didn’t, thank goodness, but he’ll have a war wound for quite some time. What he won’t have is a great tale to go along with his battle scar. How did he get hurt? He tripped. On his own feet. Walking on our sidewalk. In the last year Eli has gotten his fingers slammed in a door twice and fallen off the couch arm while he was just lying on it. Each incident resulted in a nasty injury – bloody, swollen fingers, and what we think to be a mild concussion from the fall off the couch. Even before this, Eli was a scarred kid. He has a scar between his eyes from a gash he received climbing out of the car. The nasty one under his chin? He slipped in the tub as a toddler. The jagged line just under his lip, where he nearly bit all the way through? A fall off of his bed. His broken arm? The result of a sibling tussle over Halloween decorations. Not a single injury on that kid has ever been caused by the activities we regularly let him participate in that others deem “risky.” I’m probably pressing my luck here, but he’s never been injured beyond a minor scratch or bruise from climbing, riding his bike on dirt trails, jumping ramps or skateboarding. No one would ever dream of telling us we need to remove all our doors from their hinges, take out the furniture, avoid the bath tub or keep our kids out of cars. But we hear it all the time about not letting our kids do things like skateboard, climb a tree or ride to the park by themselves. I find it mind-boggling that the perceived risks kids face while participating in active or natural play can be blown out of proportion to make us feel as if a terrible injury is imminent, while the risks kids face going about their every day activities are ignored. 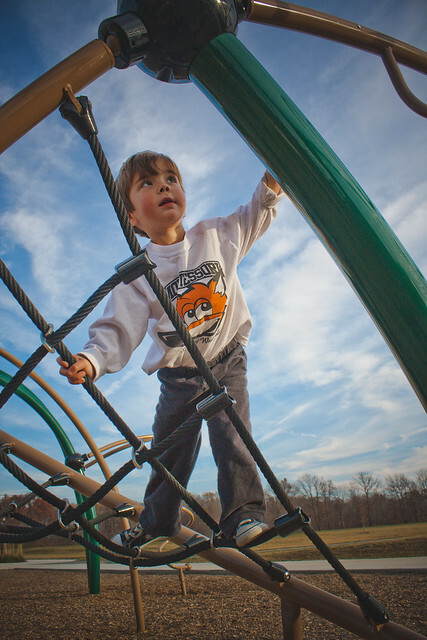 More kids are injured in car accidents or household accidents than are injured on playgrounds. Child abductions are down and kids are much more likely to be sexually abused by a trusted adult than a stranger. Instead, parents who chose to slowly let out the reins and give their kids the same freedoms we enjoyed as kids are made to feel as if we’ve left our children blindfolded in the middle of the interstate. I’ve watched my kids as they face things that involve actual risk. I’ve seen them size up a tree or a boulder before they’ve climbed it. I’ve seen them get so far and then get down, because they know their limitations. They know when to push their boundaries and they know when to back down because we’ve slowly given them those opportunities to learn on their own. Eli would never dream of riding his skateboard down a 40 foot ramp because he’s tried the smallest ramp at the skatepark and knows he hasn’t mastered it yet. It is our own dance of perceived risk vs reward, yet our kids have learned the sweetness of those rewards because they’ve worked hard to get there. I’ve watched other kids whose parents helicopter. I’ve seem them look around anxiously on the playground, scared to go down the slide because of what might happen. I’ve also seem them climb on top of the slide and put themselves in a real position of danger, because they’re bored or they’ve never had the chance to stretch the muscles that tell them whether they’re capable or not. It’s why I do what I do, why I parent the way I parent. I want my kids to learn that without taking the risk, there is no chance for reward. I want them to understand the real dangers associated with doing risky things, because they’ve been allowed to try things they’re developmentally ready for. I do not want them to be scared of the world around them by making them feel like everything, whether it’s actually dangerous or just perceived to be so, is to be feared. And hey … if they’re going to get hurt just walking on the sidewalk or sitting on the couch? Well then, what do we have to lose by letting them climb a tree? Thomas crawled into my bed the other night after a long day at camp and said, “Can you get me some dry ice and a couple of film canisters?” God, I love this kid. He had made rockets at Lego Camp that day and wanted to try it at home. Then he said, “Can we write about it on the blog?” Angels singing. We got this at Publix super market. These are harder to come by. Thomas suggested that we look at our local antique store. (I am not even going to comment.) I called my friend Beth. She has everything. The kids made these. They took a sheet of construction paper, cut it to size and rolled it up. They taped fins on the bottom. Then they slid it over the film canister. Basically you put a small amount of dry ice and water in the film canister, shut the lid, attach the rocket and BOOM, off it goes. This sounds easy , but it isn’t. We never really got the hang of the timing and the actual amounts of dry ice and water. But, hey, this is an experiment, right? So just keep trying. The cap of the film canister does fly off with a good amount of force and it hurts when it hits you, so make sure that you stand back and don’t get hit in the eye. Dry ice is risky. If you touch it with your bare hands, it will actually burn you. We used hot pads from the kitchen and winter gloves. Here is Thomas showing off his rocket. A rolling pin is useful for breaking the dry ice into small pieces. After a while, we gave up on the rockets and just played with the dry ice. The kids had a great time and it was cheap entertainment. I loved it. Thanks, Thomas, for the idea. This is the fifteenth part in a series of discussions regarding The Idle Parent Manifesto, which can be found in Tom Hodgkinson’s book The Idle Parent: Why Laid-Back Parents Raise Happier and Healthier Kids. Need to get caught up? You can do so here. For this topic, Lisa and I decided to give both out perspectives, since everyone’s definition of “mess” and “tidy,” along with how they feel about house cleaning, can be so drastically different. Happy mess is better than miserable tidiness. My mother prided herself on having a clean house and she succeeded. My friends said that our house looked like a museum. But my parents set up our basement with a pool table, air hockey, foosball and a hot tub. 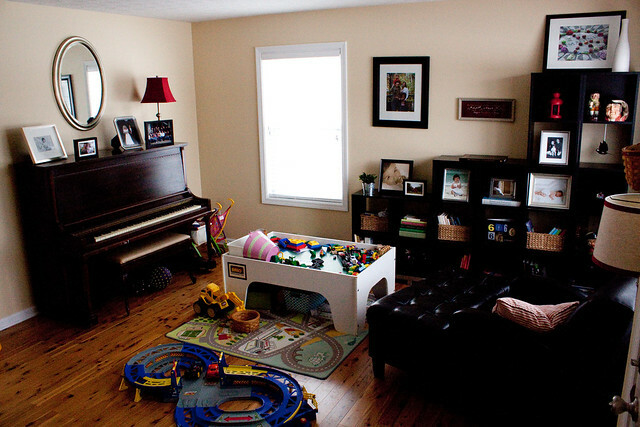 Kids flocked to our basement but I never remember hanging out in our formal living room. Roger’s house was the exact opposite. His mother found other activities that made her happy besides cleaning. It worked for both of them. I continued to rule over a miserable tidy house until we had kids. Then it took ME about 8 years to find the middle ground. Roger likes things clean but he isn’t going to drive anyone crazy to achieve it. I on the other hand, HAVE AND WILL. After years of telling me to let it go! I finally figured it out. Here is how. Do the bare minimum that still makes you happy and then cheat! 1. Tidy up before bedtime. Pick up toys, clean up the kitchen and get the coffee ready. Get everything organized so that mornings flow smoothly and are not a madhouse. It sets the tone for the day. I am convinced that this helps morning be our best time of the day. 2. Never leave a mess.I hate coming home to a messy house, so I tidy up before I leave. I never find time to come back and clean up, so I tidy up as I go. One mess at a time. I clean something up before I move on to the next mess. 3. Get rid of clutter People also confuse clean with clutter-free. My friends tell me that I have a clean house. I have a clutter-free house. Try this. It works. 4. Make cleaning convenient.. Gritty floors drive me nuts, so I keep one vacuum upstairs and one downstairs. A ring around the toilet bowl freaks me out so I have cleaning supplies in all the bathrooms. If I have the tools ready, I am more likely to use them. 5. Keep the powder room clean.Think about it. There is only one room in your house where guest lock themselves in and sit down. Go in your powder room, lock the door and take a seat. Now clean it up. 6. Spend minimal time at home.The house doesn’t get dirty if you are outside playing. 7. Rally. This is what I call the first 15 minutes after we arrive home. Put everything away right then. There is never time to come back and clean things up. I love it when someone walks into my house and says, “wow, it’s so clean.” If that makes you happy, these are great ways to get that response. Some of you out there don’t care and that is fine. What I think is important to all of us is that guests feel welcome and comfortable in our homes. They can have a good time regardless of the state of the house. It’s the feeling you get when you walk in a house that makes it a home – the feeling and the people. I’ve never mentioned it here, but I work part-time at The Container Store. Messy people don’t typically dream of working at The Container Store. They don’t call it their “happy place.” My husband is a lot like Lisa’s husband … he likes things picked up and the floors swept, but beyond that? Well, let’s just say there’s only one of us that cleans the baseboards with a toothbrush … and it ain’t him. putting your dirty clothes in the hamper. putting your shoes on the shoe mat or in the mudroom, not wherever you feel like kicking them off. picking up the messes you made. I also have the kids clean their own bathroom. I don’t care how much you like to clean, nobody likes cleaning someone else’s toilet. I have to remind myself that we live here … with children. There will be toys scattered about the house at times. Things will get spilled, dirt will get tracked in on the floors, there will be fingerprints on the doors and windows. In the not too distant future, I will have far fewer messes and more time on my hands to clean them up, and I will miss this happy, messy season. Being miserably tidy is simply not worth sucking the joy out of a home that is well-lived in. Where do you fall in the messy/tidy scale? Do you have to have things tidy? Do you struggle to keep house? Does it matter to you? Last summer I bought a new headlamp and was dying to try it out. What better way than to take an after dark bike ride? I took Thomas. He was nine at the time and he was scared. Apparently there was a very dangerous GoatMan at sleep away camp. After a few minutes of biking, he got over his fear and we had a blast. We live on a greenway. Thomas and I have been riding these trails for about five years. We’re so familiar with them we could ride in our sleep. It’s nice to ride during the day, but man … are they fun after dark. We stopped at the ball fields and ran the bases. Thomas insisted that we hit all four baseball diamonds. I retaliated by drenching him with my water bottle. He was unarmed. It felt so good. It’s ok to be out after dark. We did it all the time as kids. Who didn’t love a good game of flashlight tag? Go ahead and hand out the flashlights and headlamps and then sit back and watch the fun. Even better? Join in yourself! What are some of your family’s favorite nighttime adventures?